I saw this “Anatomy of a Pantoum” on instagram today, posted by @beabetterwriter. So, I did some more reading about the form. I guess it used to be a rhyming poem, and now not so much. So I thought I’d try both kinds… no rhyme, and a rhyme…. Because it’s April, and it was the first day of the PSSAs, the first time any of my own children have taken the test. I’m fairly sure I’m not doing this totally correctly… but hey! I’m trying! "I hope I get my teacher a good score"
PSSA-hating self hadn't signed the opt out. You knew then you had copped out. You can't beat it, so I guess you just embraced? "Why no watches or snacks?" They ask. "You can do it! I have no doubt." A Saturday in your early 40s. is one they should read? "Yes, the line is long but even if they are only $16, you should definitely try them on." I strive to teach my kids empathy, compassion, truth. Am I in charge of teaching you too? H wants to do something fun, before the weekend is over. I look up from my work. “The dollar store challenge?” I ask him with my eyebrows up, and a sigh in my voice. At the dollar store, I remember that I don’t really love the dollar store. Also, I’m not quite as creative as my 12 year old. But, I find 3 things, and I have the start of an idea. A sticker flip book! I remind Mr. Thought that he has to pick 3 things too, and soon we are checking out. I briefly wonder if the dollar store clerk thinks our purchases are odd. Sure, we have my stickers, notebook and plastic container. But there is also a plastic pot, some sort of tulle, fake flowers, a bag of soldiers, a lego flat, a pack of Pokémon cards, a mini kitchen set, a small football and some cartoon clips. Is this what people usually spend $12.00 on at the dollar store? At home we get right to work. We need to finish in 5 minutes. I am struck by creative genius: My flip book will represent my weekend. I get right to work. It really ends up quite the dramatic flip book. It shows how I start my weekends with such hope. I hope for chores to get done, children to listen, my work to move forward, maybe a book read and a movie watched… And then as Saturday morning turns into Saturday afternoon, I lose hope. My kids don’t want to do chores, I am running everyone every where instead of reading or working. By Sunday, I have gotten over my frustrations, given into the mess, and chilled out a bit. I title my story: A Mommy’s Weekend, and slip it into the plastic container. I am finished with the first ever production from #InsideTheBox Films. I just know I’ll be the winner of this first ever Dollar Store Challenge. It’s genius! Everyone laughs as they flip the pages. The boys and Mr. Thought are finished with their creations too, and it is time to vote. We aren’t allowed to vote for our own, so I vote for Mr. Thought’s Gooseball. Unfortunately for me, everyone besides Mr. Thought votes for Gooseball too. I should have known the artist of the family would win. I believe in “failing up” though, so I’m going to take what I’ve learned from this competition and bring it to the next Dollar Store Challenge! There’s a moment of quiet right now. The boys are playing upstairs. It hasn’t turned to fighting. Yet. Mr. Thought is picking up L, and the dog is taking a late afternoon nap. I’ve already cleaned my office, vacuumed most of the house, and mostly kept up with the dishes. There’s a moment of quiet right now. I am not so good at moments of quiet. If I don’t know how long the moment will last, how can I choose what to do in that time? Should I read? Write? Nap? Start dinner? Start cleaning the porch? If I get up and open the door to go to the porch, the dog will certainly get up from his nap. Same if I start dinner, or go upstairs to nap. That leaves reading and writing… but my book is upstairs. There’s a moment of quiet right now. I should write. I have a slice, and a scholarship application, and work things to write. I can totally write because it’s quiet, and my desk is cleaned off, and my shelf is organized, and did I mention that the dog is napping and the boys are playing quietly? There’s a moment of quiet right now. I should write. This is my time, my chance before the craziness of the evening, the night, bedtime. This is my opportunity before the boys start fighting and my daughter comes home, and everyone is hungry for dinner. There’s a moment of quiet right now. I should totally write. I’m not so good at moments of quiet. 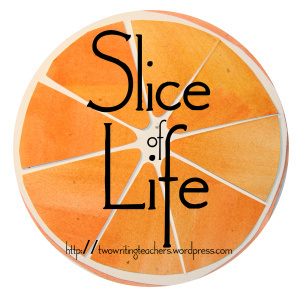 #sol19 March 29 A Slice of Writing Habits. Every time I post a slice, the WordPress app dings on my phone to tell me the good news. Ding! "You're on a 28-day streak on On A Thought!" It will say today. "Nice try, but I think you were tired for this one." "Shouldn't you be in bed?" "Are you letting your kids have more screen time so you can accomplish this streak?" "Well, bad writing is still writing!" "In the past, your slices meant something!" "You're holding back! Write from the heart! Forget about confidentiality!" "Oh, you went with the 6-word memoir again?" "Didn't you say you wanted to be a writer?" So, I'd say, "Thanks for the feedback." And then the next day, I'd try again. I happened to be at a meeting just around the corner from the restaurant he was talking about, so I agreed. Sometimes I’m nice. As I pulled into his school parking lot, I realized that I should have made sure he wasn’t going to get in trouble getting a dinner delivered. Sometimes I’m not so quick. He met me at the sidewalk, and I asked him if he was sure this was okay. “Oh yeah,” he said. “Everybody is getting food delivered, Chick-fil-A mostly.” Sometimes I’m extra proud of my vegetarian kiddos. I gave him a hug and told him to have a great rest of practice. “Wait!” he said. “I want to give you a real hug. Thank you so much for doing this. This is the best dinner delivery ever.” He put his food down on the sidewalk and gave me a big 6th grader hug. Sometimes gratitude can melt your heart a little. At home, I gave the other veggie burger to my 10th grade daughter. “Thanks!” she said and sat down to dig in. Sometimes gratitude comes in different levels. Sometimes it’s nice that your kids have a device they can use to text you.